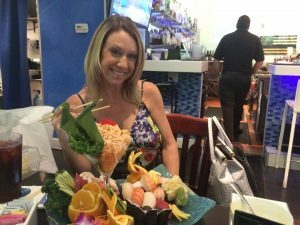 Today the RE/MAX Dream Team had a lunch meeting at Blu Sushi in downtown Fort Myers, and during lunch we overheard that they are doing a special event for Shark Week. Thursday July 26th from 5-7pm they will have free food and drinks as a Shark Week celebration. We caught them taking photos and videos to promote the event, and our broker Kynse got their picturesque platter!